A Sukhoi Superjet 100-95 was involved in a flight test accident during a go-around at Reykjavík-Keflavík International Airport (KEF), Iceland. The five persons on board suffered minor injuries. At 04:03 hours local time the Sukhoi Superjet took off from runway 20 at Keflavík Airport for flight testing with a crew of five on board. The airplane had been undergoing certification flight tests for almost one month at Keflavík Airport. This was the crew's fourth test flight since their work shift started at 18:00 the day before. The pilot flying was sitting in the right cockpit pilot seat. During the final approach to runway 11 at 05:22, the landing gear was selected down. The approach was normal. At 05:23 the flight crew initiated the 9th test of the flight. The purpose of the test was to simulate a CAT IIIA automatic approach, close to the airplane's maximum landing weight limit, while in crosswind exceeding 10 m/s (19.5 knots), with a critical engine failure occurring at radio altitude of 25 feet, resulting in a low pass/missed approach. At a radio altitude of about 4 feet the pilot flying disengaged the autopilot. This caused disengagement of all autopilot/flight director control modes and the left autothrottle reverted to SPEED mode. When the left autothrottle reverted to SPEED mode, the left throttle lever had already reached IDLE. At that time the airplane speed had reduced down below the "limit selectable speed", so the left autothrottle started moving the left throttle lever forward. The airplane's aural warning "LANDING GEAR NOT DOWN" triggered at that time. This was followed by the engines' cowlings touching the runway. As the airplane nose had been turned into the wind when it hit the runway, it initially veered to the right, as it skidded down the runway, across the runway centerline. The pilot flying counteracted this movement with a left rudder input and steered the airplane back towards the runway centerline. The pilot flying set both throttle lever's to IDLE position at and then to deploy the thrust reversers. The airplane skidded off the end of runway 11 and came to rest after having passed 163 meters beyond the threshold of runway 29. 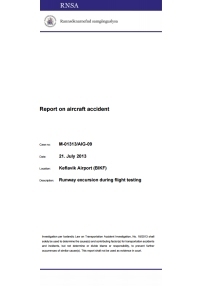 The Icelandic Transportation Investigation Board determined that the most probably cause of the accident to be flight crew fatigue, which resulted in the flight crew advancing the incorrect throttle lever to TO/GA position. This occured after the airplane touched the runway, which had resulted in the automatic flight control system shutting off.